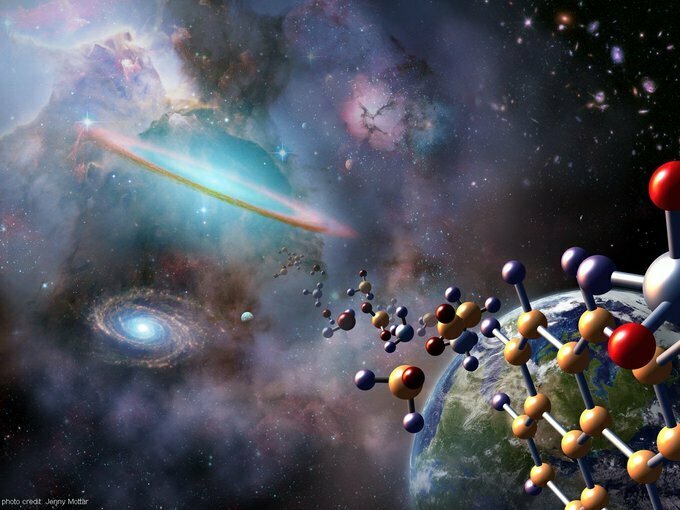 Just like the mythical creation stories that depict the formation of the world as the story of order from chaos, the early Earth was home to a chaotic clutter of organic molecules from which, somehow, more complex biological structures such as RNA and DNA emerged. There was no guiding hand to dictate how the molecules within that prebiotic clutter should interact to form life. Yet, had those molecules just interacted randomly then, in all likelihood, that they would never have chanced upon the right interactions to ultimately lead to life. "The question is, out of all the random possibilities, are there any rules that govern these interactions?" asks Ramanarayanan Krishnamurthy, an organic chemist at the Scripps Research Institute in California. These rules would be selective, inevitably leading to the right interactions for assembling life's building blocks. To unlock the secrets of these rules and how the prebiotic clutter transitioned to the biologically ordered world of life, Krishnamurthy utilizes a discipline called "systems chemistry," and published a paper concerning the topic in the journal Accounts of Chemical Research that explores this relatively new way of understanding how life came from non-life. Nobel prize-winner and geneticist Jack Szostak of Harvard Medical School describes systems chemistry as: "one of the news ways of thinking about the problems of prebiotic chemistry." To understand how systems chemistry works, think of a flask full of chemical A, to which another chemical, B, is added and which reacts with A to produce two more chemicals, C and D. Since no process is 100 percent efficient, the flask now contains chemicals A, B, C and D. "So now you have a system," explains Krishnamurthy. Systems chemistry considers the system as a whole and explores the rules within that system that govern how each chemical interacts with the others, and in different conditions. Yet, systems chemistry is about more than just dealing with systems containing many chemicals, says Szostak. "It's a matter of thinking about what chemicals or conditions are likely to be available and likely to be helpful." He cites the example of phosphate, which is automatically present in biochemical systems because of its existence in biology's nucleotide-building blocks, and therefore is on hand to play multiple roles in the story of life, such as acting as a catalyst and protecting cells from pH changes. Of course, unravelling the chemistry of the prebiotic clutter is a far cry from explaining the interactions of four chemicals in a flask. The computing and analytical power required to simulate such a complex system was beyond reach just a decade or two ago. 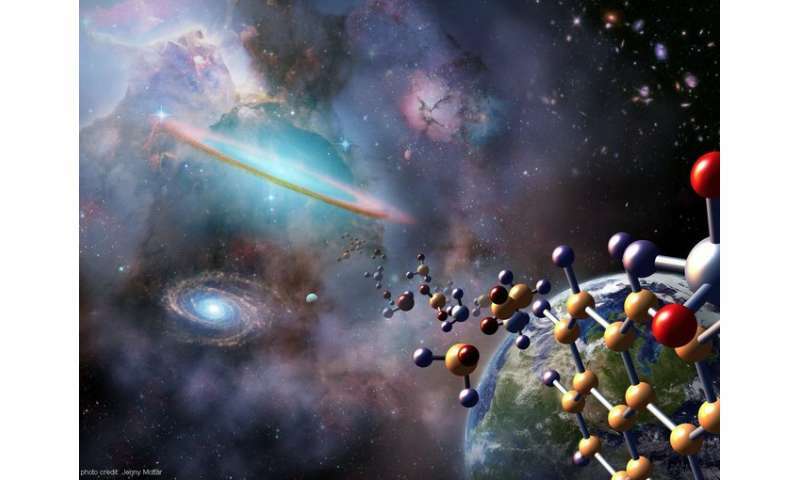 Instead, the majority of research into the origin of life previously had focused on individual classes of biomolecules, the most promising being RNA (ribonucleic acid). When the University of Colorado's Thomas Cech discovered in 1981 that RNA can catalyze reactions within itself, the problem appeared to have been solved. Overnight, RNA's importance to life was transformed. By being catalytic, RNA could kickstart other biochemistry including the formation of proteins and therefore had to come first. The subsequent discovery that it is the RNA molecule in a ribosome that is responsible for protein synthesis gave further credence to the "RNA world" hypothesis. The RNA world has, however, come in for much criticism lately, which Krishnamurthy believes is deserved. RNA is able to transfer genetic information in organisms and is made of chains of ribonucleotides. But there's a catch. "Nucleotides don't just pop up from chemical mixtures, they have to be made in a very defined manner," he says. "There has to be a certain order to the reaction sequence. It's not like Stanley Miller's spark discharge experiment where he put all these gases together, pressed a switch and 'Voila!'" Systems chemistry depicts the development of RNA as a chain of events driven by selective interactions and catalysis. Ribonucleotides are formed from ribonucleosides linked to phosphate. A nucleoside consists of a nucleobase, which is a nitrogen-bearing compound, bonded to a monosaccharide, which is a sugar containing five carbon atoms, called pentoses. Among the population of monosaccharides are four pentoses, among them ribose, which is somehow selectively converted into ribonucleoside instead of the other three pentoses. Although Szostak agrees that systems chemistry has the power to support the RNA world theory, or at least explain the origin of RNA, he points out that a disproportionate amount of work has been put into understanding how nucleotides form, and not enough into what happens after that. "There are still missing steps in understanding how RNA could be made," he says. So, the challenge now for systems chemistry is to show how and why each of these stages occur. "Just synthesizing a monomer of RNA like a nucleoside or a nucleotide isn't enough to say you've found the origin of RNA," says Krishnamurthy. "How do you put those monomers together in a meaningful manner that is self-sustainable?" The selection effect could be taking place at a multitude of levels in the creation of RNA. Perhaps the selection rules are what determines why ribose, rather than the other three pentoses—xylose, lyxose or arabinose—is converted into the nucleosides used by RNA. Maybe the selection effect comes when explaining why phosphate prefers to bond with ribonucleosides, rather than any other nucleosides. Or, possibly it is the ribonucleotides themselves that are selected by being more efficient than other nucleotides at forming chains. We don't know what the answer is yet, but Krishnamurthy believes that systems chemistry is the best tool for finding out. We find selection rules driving interactions in chemistry as a result of environmental conditions; or emergent properties such as catalytic activity, self-assembly and self-replication; or even as a result of the specifics of chemical reactions. Cyanide, for example, takes the form of non-toxic nitriles in biochemistry, linking with carbon-based molecules to form more complex organic molecules. It's also a pretty handy reactant. Add cyanide to two specific organic compounds containing ketone and carboxylic acid, called keto acids and keto alcohols, and it produces cyanohydrins that are important precursors to some amino acids. However, in water cyanohydrins can undergo hydrolysis and break down, but whether they do or don't depends on the pH of that water. In a paper published in Chemistry: A European Journal, Krishnamurthy, Scripps colleague Jayasudhan Yerabolu, and Georgia Institute of Technology chemist Charles Liotta found that hydrolysis takes place at a pH of less than 7 for cyanohydrins formed from keto acids, and a pH greater than 7 for cyanohydrins formed from keto alcohols. Therefore, the longer-term survival of cyanohydrins is selective dependent on the acidity or alkalinity of the surrounding environment. Another example encompassing cyanide-reactivity involves molecules of oxaloacetate and alpha-ketoglutarate, which play a role in the citric acid cycle (a series of energy-releasing chemical reactions utilized by oxygen-breathing life). In the presence of cyanide, oxaloacetate is selectively transformed instead of alpha-ketoglutarate, to form a hydroxy-succinic acid derivative. "In a mixture where you can find both oxaloacetate and alpha-ketoglutarate, by adding cyanide you can selectively transform one but not the other," says Krishnamurthy. These examples demonstrate what Krishnamurthy describes as the transition from heterogeneous heterogeneity (diverse interactions in a system of many molecules) to homogeneous heterogeneity (selecting from diverse interactions between relatively few molecules forming the backbone of life's systems, such as RNA). In other words, it is the emergence from the prebiotic clutter of an orderly proto-biochemistry. "The solution seems to be to move from the heterogeneous mixture to what I call the homogeneous heterogeneity," says Krishnamurthy. "This is what our lab is trying to demonstrate as a proof of principle." There is a long way to go yet and Krishnamurthy recommends that progress will be best made with baby steps as scientists develop this bottom-up approach to the origin of life from the heterogeneous prebiotic clutter. By discovering reactions and catalysis that select the right interactions between organic compounds, the aim is to build up our understanding of how the basic building blocks assembled—how, for example, RNA emerged from the chaos. Ultimately the wish is to build an experimental simulation that includes the entire heterogeneous heterogeneity of the prebiotic clutter in a replica of Earth's early environment, and then to run that simulation over and over again to see which selective interactions are most common and whether they can repeat the origin of life. "I'm optimistic that we will be able to work out reasonable pathways for making all the building blocks of biology, and for assembling these components into simple, primitive cells," says Szostak. "However, there is a lot to be learned before we can accomplish this ambitious goal." Just like the flask that ended up containing chemicals A, B, C and D, the end products of these selective reactions could start interacting with their source chemicals, something that doesn't happen in the clean, isolated RNA world that is studied in the laboratory. What new and previously overlooked solutions await to be discovered and how quickly will the baby steps get us to them?